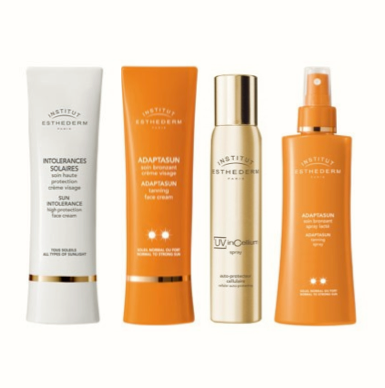 I’ve had lots of people asking about Institut Esthederm’s amazing sun products, so I thought that I’d do a quick overview. The fact is that Institut Esthderm do things a little unconventionally – they don’t work with the traditional “SPF” rating and they can’t tell you, really, what level of “protection” you’re getting from a product. This is because their suncare helps the skin to gradually adapt to the sun and protect itself rather than just blocking or filtering the rays. It’s all pretty complicated stuff and Institut Esthederm have been researching, developing and testing these products for decades, but it works. I have used quite a few different products from different ranges now, and not only do they offer superb protection (note that you MUST use a strength suitable to your environment and exposure level!) they also help the skin to develop a more uniform colour. You have to take a little leap of faith with Institut Esthederm’s Adaptasun range, because of the absence of that all-important SPF rating. We’re very used to grabbing an SPF 30 and believing that it will do the job – if it’s not that sunny we might use an SPF 15, or if it’s really hot we might search out an SPF 50 – but we trust in those numbers, they satisfy our “health and safety” requirements. We know where we stand with the SPF, but with something that claims to make your skin do the work? It’s a little scary, I suppose. But for me, the Esthederm products really are up there with the Rolls Royces of suncare – advanced, hi-tech formulas that minimise the harmful effects of UV radiation whilst grabbing hold of the positive effects. For someone like me who loves to spend time in the sunshine and get a light, safe tan, these products are simply perfect. So here’s little guide to my tried-and tested products – if you’re wondering which Institut Esthederm products would suit your skin, then hopefully this will be of help! …the Bronz Repair Anti-Wrinkle Tanning Cream. (If you want to read the full review, it’s here.) At first I couldn’t see much of a difference between this and the Adaptasun, but after lots of testing I do find that this works a little better at giving my face an even, sunkissed glow. My face doesn’t tan that easily (my body does) and so it’s no mean feat that I can get a beautiful, light tan after just a few hours using the Bronz Repair. It is more expensive (£49.50 with free delivery from FeelUnique.com) but I think that the extra cost is justified – this is an “anti-wrinkle” version and the ingredients have been whacked up a notch or two for a really high-powered sun cream. 2) Adaptasun Tanning Spray for the body. A spritz-on water that works in the same way as all the Adaptasun products, encouraging the skin to protect itself for a fast, safe tan. You really will find that you tan more quickly and evenly after using this spray and it’s really convenient to apply. No stickiness, no greasiness, it just sinks straight in. (£35.10, FeelUnique.com as before.) I use it in the “run up” to my hols, too – you can do that with any of the Adaptasun products. They almost “prime” the skin for sun exposure. 3) Sun Intolerance High Protection Face Cream (£36.90 FeelUnique.com) helps sun-sensitive skin to adapt to moderate sun exposure. This doesn’t allow someone who usually can’t abide any sun exposure to go and sit on a sand-dune in the Sahara – that would just be asking for trouble! But instead of just shielding the skin, this cream actively helps the skin to become accustomed to the sun whilst minimising the risk of reactions. Clever stuff! Great for the kind of sunshine that you’d get on an average summer’s day in the UK, but if it was baking hot you’d want to tread carefully. As with anything to be used on sensitive or sun-sensitive skin, take baby-steps when trying something new out for the first time!